The Ancient Kingdom of Fife, just north of Edinburgh and the Firth of Forth, is perhaps most famous because of St Andrews the undisputed home of golf. But Fife isn’t just St Andrews, there’s a wonderfully relaxing atmosphere throughout Fife, from the delightful fishing villages of the East Neuk to the rolling hills of the Howe. It’s not just golf either, Fife is very horse friendly. Check out the Remus Equestrian Centre which has been providing equestrian services for twenty years. Or the Scottish Carriage Driving association, the home of carriage driving in Scotland. From horse riding in Fife to cycling and fishing this beautiful Scots county has a whole lot to offer. Our Riding School is located in the heart of Fife, convenient for Kirkcaldy, Glenrothes and Dunfermline. We offer riding lessons for beginners to advanced riders with Shetland ponies for four year olds to dressage and jumping lessons for the serious rider. 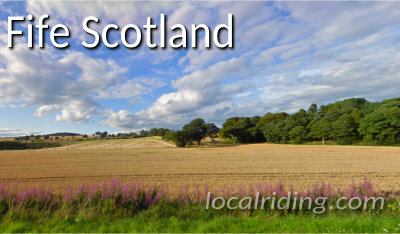 If you offer horse riding or other equestrian services in Fife and you’re not in the above list, be sure to contact localriding and Submit Your Details to our Fife Section or simply add your equestrian centre or horse facility details in the comments section below.